Last month I wrote about Things I’d Never Do Again When Travelling and I was genuinely surprised by a lot of the responses I got. Comments like “I would never do that” and “you’re much braver than me” had me thinking…me? Brave? Really?! Apart from the time I was almost mugged in Namibia, I have never thought of myself as a brave person. I’m just a reserved little lady who likes experiencing new things! Whether it’s visiting somewhere I’ve never been before or an adrenaline-pumping activity, I always jump at the chance to do something I’ve never done before. The name of the blog is, after all, Mrs Ayla’s Adventures, so it’s only right that Mr Ayla and I give you lots of adventures to read about! Last week I came across an article by Into the Blue on how Brits are more likely to try new things when on holiday. It’s no surprise that travel opens us up to a whole range of things we’ve never experienced before from different cultures, strange traditions, and places some people only ever dream of seeing. But despite it showing that a lot of people are open to trying new things when travelling, I was shocked that only 49% said they would try the local cuisine. Trying foods from around the world is one of my favourite parts of travelling. I would make return trips to Italy, India and plenty of other places purely to enjoy their mouth-watering cuisines again. One of my biggest pet hates is when people travel to a different country and then complain about the most ludicrous things. The food was different, there was nowhere for them to eat a roast dinner, there were too many foreigners, or – the best one I’ve heard yet…“we didn’t realise there would be fish in the sea”!! If you’re one of these people then you really should seriously consider just staying at home. From the list of questions in the article that people were asked if they’d ever do when abroad, I’ve done all of them. I’ve been skydiving in Namibia, white water rafting in Rotorua, screamed my lungs raw at jet boating in Tunisia and completely failed at surfing in Cornwall. I’ve climbed mountains and looked after lions and cheetahs. I’ve made friends with locals and stayed in strangers’ homes. I got a tattoo in Cairns, safe in the knowledge that my mum couldn’t kill me from the other side of the world. And I’m sure you know me well enough by now to know that I always try the local cuisine. But I don’t think any of this makes me brave. Travel is one of life’s biggest adventures; it frees us from our responsibilities, introduces us to new people and experiences, fills us with confidence and throws us completely out of our comfort zone. But isn’t that the point of adventure? 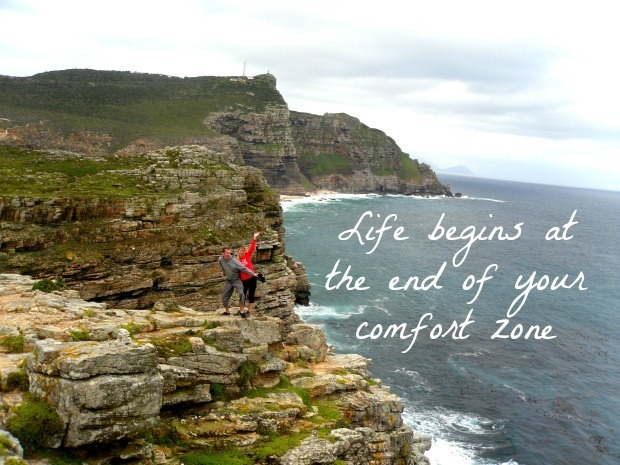 “Life begins at the end of your comfort zone” so the saying goes, and I’m a firm believer that we should all be a bit braver and more adventurous when we travel. After all, if we never tried anything new then life would be a hell of a lot more boring. Have you tried anything new when travelling that you’d never do at home? Let me know in the comments! Exactly Allane, there is no point in travelling if you’re not interested in experiencing new things! Haha the skydive was not me being brave – I was absolutely terrified but I had no choice, the instrtuctor just jumped out the plane and I happened to be attached to him!! im extremely impressed. i wish I had your daring! once you get on you start to like your comfort zone too much! I guess most people like what they’re used to and a lot of people don’t like change. I get bored very easily though and I hate routine so maybe that’s a reason why I love experiencing new things so much. I’m sure you’ve been adventurous on your travels too! So right. …what is the point of travelling if you are not ready to experience the culture and things the country has to offer. Such a waste it is on some people though. It’s ridiculous! Actually there was another complaint I saw that said the beach was sandier than they were expecting. I mean what on earth goes on in these people’s minds?! Trying crazy stuff might seem scary at the time but they make the best memories! LOVE this post. The quote at the end is one of my favourites and one of the principal reasons I moved to Doha. I’m always looking to stretch myself a little further and do more new things – I genuinely believe it makes you a better and more well-rounded person. You’ve had some amazing adventures so far, I’m looking forward to following along with many more! Bungee jumping is most definitely brave! For me, going on holiday is about trying new cuisines, meeting the locals and getting out of your comfort zone – otherwise what’s the point in travelling! Sky diving yes but I’m not so sure about bungee jumping. I think that’s a bit too brave even for me haha! My thoughts exactly Suze…what is the point in travelling if you’re not going to experience all these amazing things the world has to offer!